The 1967 Alvis Burns Special is the only one of its kind in the world and it will be featured at the Silverstone Auctions event, the Race Retro and Classic Car Sale on February 23rd in Britain. The car is completely original and in immaculate condition. It's had mechanical repairs done to keep it in top running condition, and the interior trim work has been refurbished to exacting specification. 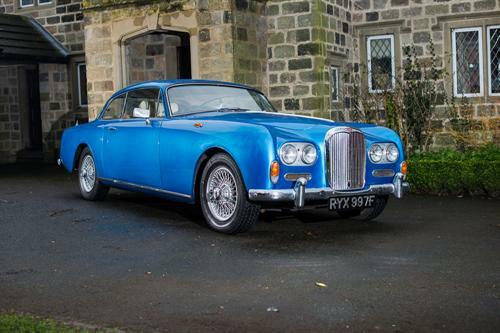 The car has won several awards at various Concours e'Elegance events around Europe and was displayed on the Alvis Club Owners Stand at the NEC Classic Motor Show in November. In 1966, businessman James Burns conceived of the idea for this car, hoping to fill a niche in the export market. The 5.4-liter concept was built as a working production prototype in late 1966 with an original chassis and bodyshell as an upgrade to the company's 3-liter model. It was showcased in 1967, but changes and mergers in Midlands auto manufacturer's circles ultimately stopped the car from going to production at all. So this prototype was the only one built. “Classic cars don’t come much rarer than this so it’s a privilege for Silverstone Auctions to offer it for sale at the Race Retro and Classic Car Sale,” added Nick. The car's value is estimated between £60,000 to £70,000 and it will be lined up with many other road-going classic, race and competition cars. All will be sold at the Race Retro weekend at Stoneleigh Park starting on February 22nd. Find out more at silverstoneauctions.com. is it true ??? this car has a wooden chassis? und this was repaired now??? as whrite the czech motor magazine??? The original idea for this car involved a model mockup that was made with a wooden chassis, but the actual car built (shown) never had one - it was always metal. Thank You so much, dear Aaron, I can now rectifie the nonsens in the czech press...Joshua.